• Promoting long term digestive and immune health Every capsule of Digestive Advantage contains 1 billion viable cells of our patented BC30 probiotic. These convenient fast-acting probiotic supplements deliver fast-acting relief for multiple digestive issues. 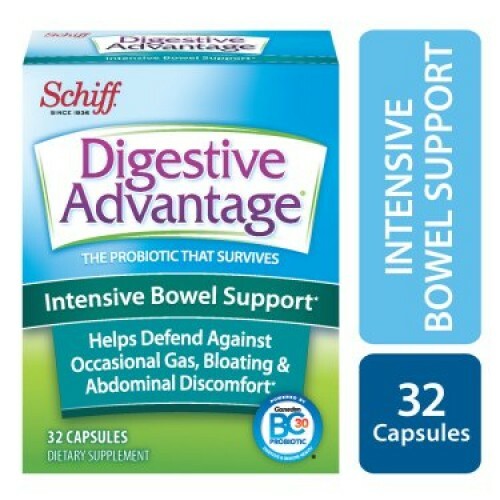 Fast-Acting Support with Digestive Advantage Digestive Advantage digestive enzyme supplements break down hard-to-digest carbohydrates quickly to help stop gas before it starts. If youve experienced gas and stomach pain after eating, its smart to have a probiotic supplement nearby, just in case. Trust Digestive Advantage for faster relief from bloating and discomfort when you need it most.Probiotic Supplements Scientifically Proven to Survive Digestive Advantages patented probiotic BC30 is surrounded by a protein shell to survive stomach acid 100x better than leading probiotics and yogurts. With Digestive Advantage, more active probiotic ingredients make it to the affected areas. Studies show that BC30 probiotic and digestive enzymes break down proteins, carbohydrates and fats to aid in the digestive process. 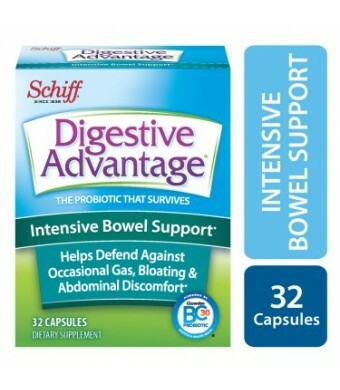 This easy-to-take supplement is your simple solution for symptoms like bloating, gas, or diarrhea.Long-Term Relief for Gas, Bloating, and DiarrheaDigestive Advantage Intensive Bowel Support is a once daily probiotic supplement that promotes long-term digestive and immune health with continued use. Our efficient digestive enzymes will deliver fast symptom relief and help to prevent abdominal discomfort, bloating and gas in the future. Take steps toward better digestive and immune health every day with a single probiotic supplement from Digestive Advantage.Guaranteed Quality, Purity, Freshness, and Labeled Potency Digestive Advantage is a name trusted for fast-acting relief. 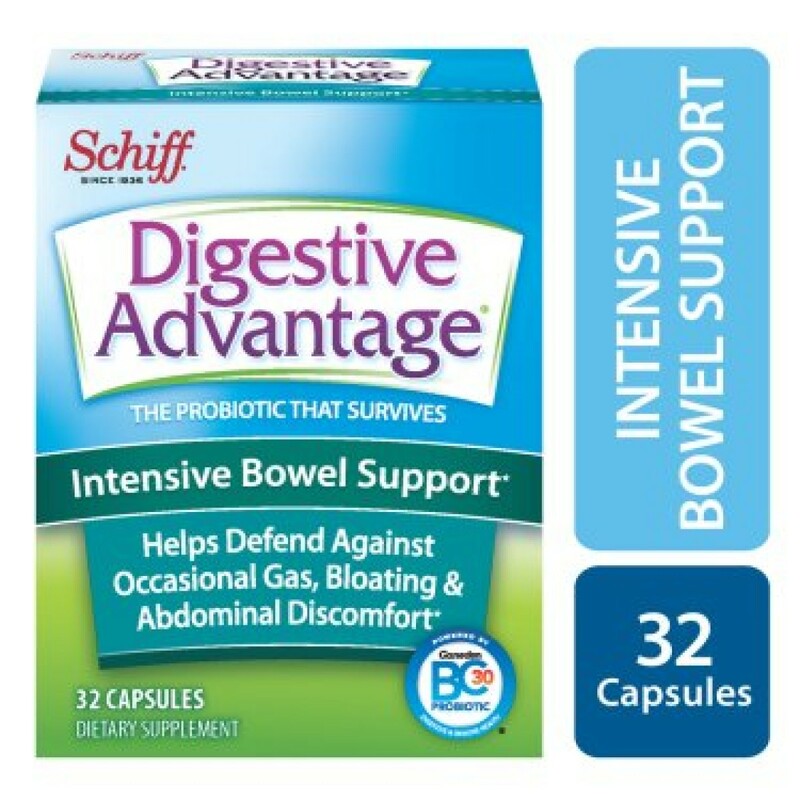 These probiotic digestive enzyme supplements contain absolutely no preservatives or artificial flavors and are protected by Schiffs Quality Guarantee. Choose the probiotic supplement that gives you a leg up on your symptoms with Digestive Advantage.There are Digestive Advantage probiotic supplements for a wide range of digestive symptoms. For relief from consuming dairy products for people with lactose intolerance, try Digestive Advantage Lactose Defense Formula!These statements have not been evaluated by the Food and Drug Administration. This product is not intended to diagnose, treat, cure or prevent any disease.Based on median % survivability of Digestive Advantage probiotic vs. leading probiotic supplements and 19 probiotic yogurts in simulated gastric PH for 2 hours. Survivability and delivery of probiotic cells to the small and large intestines is one of the several factors influencing overall product effect.